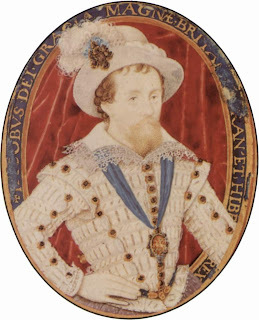 The Lion and Unicorn nursery rhyme dates back to 1603 when King James VI of Scotland became England's James I. James' image was captured by Nicholas Hilliard (1547 - 1619) who is remembered for the portrait miniatures he did of the courts of the king and his predecessor Queen Elizabeth I of England. A union of the two crowns required a new royal coat of arms. The lion and rose stands for England and the unicorn and thistle for Scotland. 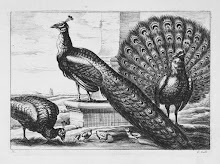 The heraldic animals were joined together as supporters on the Royal Coat of Arms of Great Britain depicting a crowned lion on the right and an uncrowned unicorn on the left. 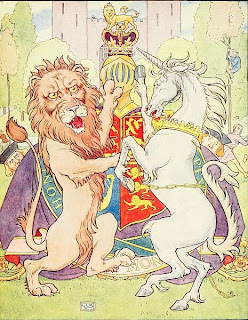 American illustrator Frederick Richardson (1862-1937) shows the lion and unicorn fighting over the crown. Leonard Leslie Brooks (1862-1940) the British artist and writer also illustrated the nursery rhyme. 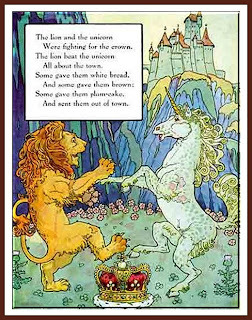 Although in the verse the unicorn gets the worse of the fight, in Scotland he is equal to the lion. The Royal Coat of Arms displayed in Scotland places a crowned unicorn to the right and the crowned lion is on the left, together on a bed of thistles.